The month is halfway over and I have read one entire book so far this year. Obviously, it’s time to step it up. But at least it was a good one. I picked this book up at the library last April, after Bart and I watched the movie, Jobs. 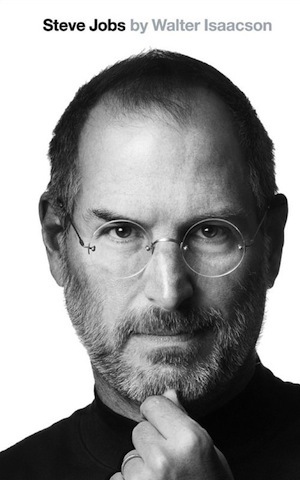 I don’t know if you’ve seen a physical copy of Steve Jobs, but. . . .this book is hefty. Unsurprisingly, I ended up returning it after reading only seventy-five pages or so. I knew in my heart of hearts that the only way I’d get through it was on audio, so finally, when I had a free credit through Audible.com, I downloaded it and spent a couple of weeks listening (the thing is 25 hours long. Even at double speed, that’s a lot of hours). And it was tremendously good. When I’d read the paper copy, I’d flown through the part about his childhood, but then got bogged down by his travels and drug use during college (snooooore. . . .), but once I got through that, I couldn’t get enough. I wouldn’t call myself an Apple diehard, but I remember going off to college and becoming enamored with the Apple computers on campus (and when I bought my first laptop after I got married, it was a iBook). In 2005, I used most of the grocery money my parents had sent me one semester to buy an iPod (I was dating Bart and his parents invited me over for dinner so often that I basically never ate at home except for some cereal for breakfast). And, of course, I remember going to see Toy Story in the movie theaters, as well as most of the Pixar films that came after that. It was hugely fascinating to see how these products unfolded behind the scenes – how the iPod came about or how Disney and Pixar worked (and didn’t work. . . ) together. When these items are such a huge part of the cultural landscape, it’s really cool to hear all about who was involved, what kind of decisions were made along the way, and how people thought things would play out versus how they really did. And isn’t that the million dollar question? Because the book isn’t really about Apple or Pixar or Next or the Silicon Valley. It’s about Jobs, and he’s a pretty complicated guy. Sometimes I thought he was the most brilliant guy alive and other times you wished someone would just give him a quick smack across the face. When he got thrown out of Apple, I felt like Apple had done exactly the right thing. Jobs was just so difficult to work with. And when he started Next, you could see some of his true over-the-top perfectionism come out, where he spent millions of dollars redoing the office buildings or having all the assembly lines redone the opposite way so they’d look better from the viewing platforms for visitors. It’s one thing to have creative vision, but it’s another to spend yourself dry doing it before you’ve made a dime in profit. But as he got older, it seemed like he mellowed out (some) and was more reasonable about his products and his companies, willing to listen to people with good ideas and make necessary compromises. One interesting bit was that his closest friends and family couldn’t tell whether he just had no filter about the things he said or if he knew it was rude or unkind and just didn’t care. If you have any interest in technology or powerful people of our era, this book is absolutely worth reading. Also, you might have a whole new respect again for how incredible your iPhone or iPod is. Those are groundbreaking innovations right there, and lots of us just carry them around in our pockets. (But a warning that, if you’re listening to it, keep your headphones on if you are around children – you’re likely to hear some good swearing from a Steve Jobs quote at any moment). How do you think it compared with the movie? We all have those books we keep meaning to read and are genuinely excited about….but never get around to. This is one of mine. He is so inspirational. I heard that he was such a perfectionist that for years he lived in an empty while house with one table in it – the definition of tortured genius surely. I started this quite a while ago, too, but like you abandoned it when it go to his eary adult years. Your review makes me want to pick it up again. Since I don't really like audio books (too much daydreaming and not having a clue what I am listening to – but a lot of supper plans being constructed in my head while I was attempting to listen to the book), I would have to actually read it. Maybe someday! Cereal for breakfast? I recall mostly chips and salsa with sour cream. Ha ha ditto to Sherry's comment! I still consider chips and salsa with sour cream a signature Janssen dish! I got this book for my brother in law a couple Christmases ago but haven't read it myself… I might have to steal it from him now!